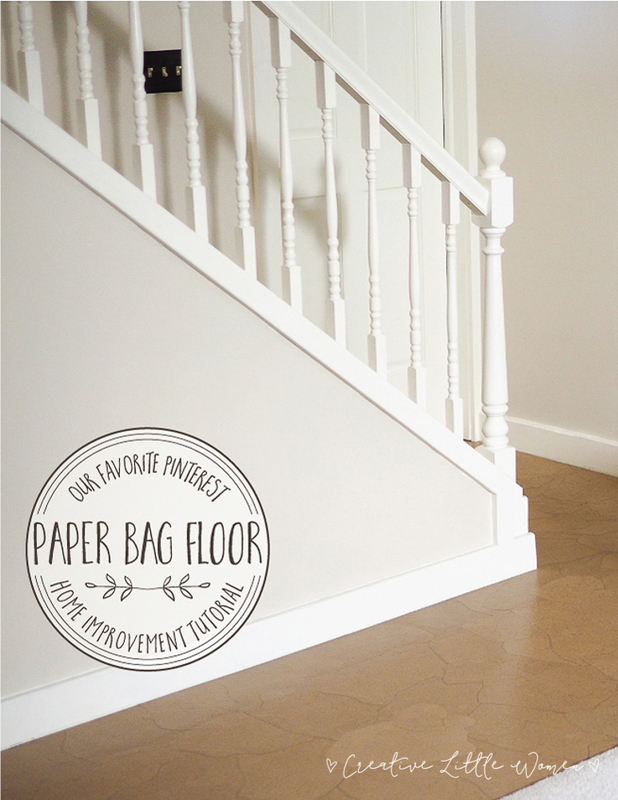 The ultimate diy flooring – brown paper floor. Today I wanted to share with you about our brown paper floor, which is hands down my favorite Pinterest find of all time. A few years ago our finished basement flooded due to a faulty sump pump. It’s amazing what a disastrous mess 5-6 inches of water can do. We began researching how to redo what was ruined on a minimal budget. After googling ‘cheap flooring’ late one night I found various posts about ‘paper bag floors’. I had never seen anything like it before. I was almost instantly convinced that this was what we needed to do on our basement concrete. After many hours of research trying to find all the answers I needed before beginning this huge process (about 600 sq. feet of concrete floor to be covered), I purchased my needed supplies and began. There are countless tutorials on the internet however my personal favorite was this one. I love the look of the unstained paper as well as the idea of tearing the paper to look like rocks. If you do a search you will see countless variations, even some that are done to look like wood planks. The possibilities are endless!The basic supply list: Heavy contractor’s paper (from the paint section at Menard’s). Weldbond glue. Although Elmer’s works for laying paper on top of wood, we were laying on concrete. Several people shared struggles with adhesion on concrete and they said that using Weldbond instead minimized the problem. It worked amazingly well! Varathane floor finish in satin. The floor finish is the most expensive part of this project, but this particular brand applied super easy, dried quickly and it had very little odor. It’s also water based so it cleans up easily as well. You’ll also need a couple of inexpensive paint brushes. Basic process: Clean the floor thoroughly with soap and hot water. Sand any rough areas and fill in gaps. We were covering concrete slabs in the basement, so I filled in the grooves between the slabs with DAP filler and sanded again. For the ‘rock’ look, tear the paper into random sized ‘rock’ formations. Always tearing, never cutting with scissors. *An important thing to note is that the paper has a front and back. If you want a uniform color pattern, mark the underside of the paper with a pencil so you know which side to place towards the floor. Crumple each piece of paper into a ball and set aside. 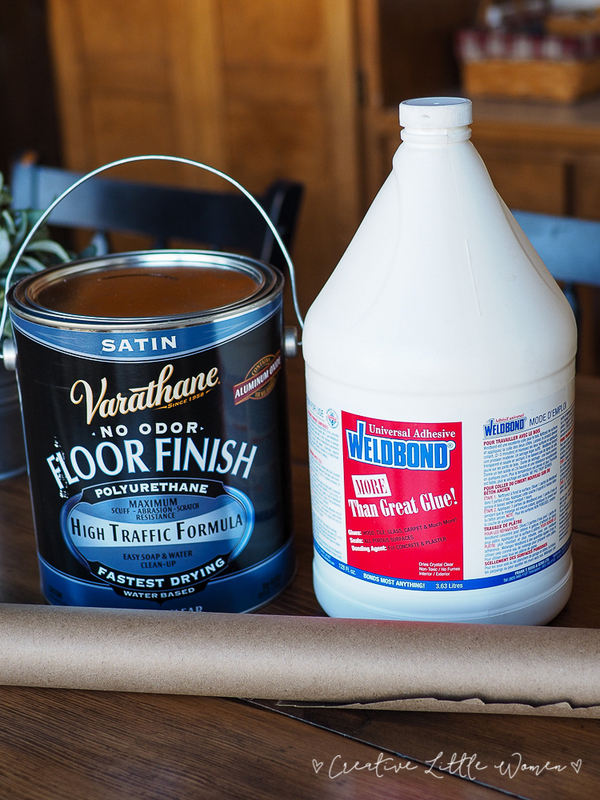 Prepare your glueby mixing 1/3 part glue to 2/3 parts warm water (if using Weldbond). If using Elmers you would use a 50/50 ratio. I mixed my glue in a bucket and then poured a portion into a paint roller tray and dipped my paper pieces in the tray, using a paintbrush to make sure every portion of paper was covered. I placed the larger ‘rocks’ down first, and then filled in with smaller. I also made sure to have some straight edge pieces for along the floorboards. Using the paintbrush, gently brush out any large air bubbles before moving onto the next piece. After the floor is completely dry coat with several layers of the sealer (we did around 5 layers). Although this project stretched out over a period of time we could still walk on the finished portion without damaging it. We absolutely love it. 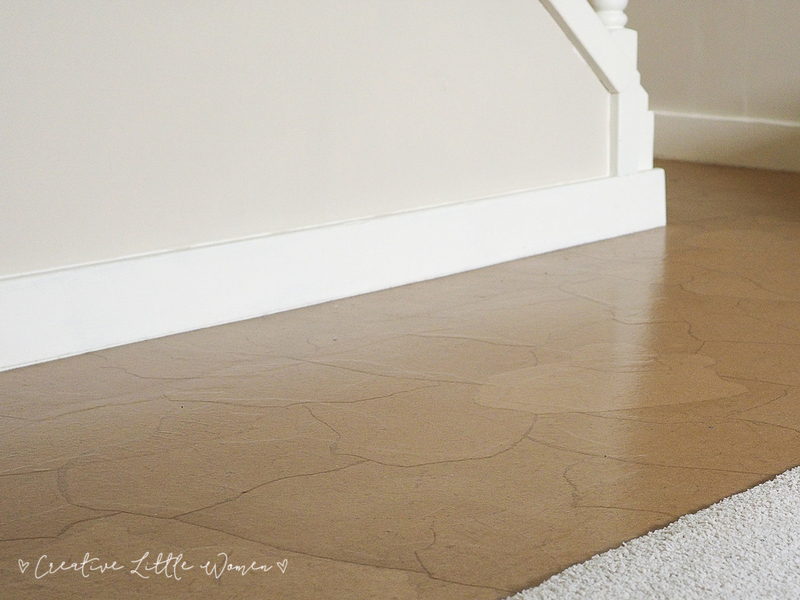 We love the look of the floor, it cleans easily and for some reason it’s super soft to walk on (I have no idea why!) It has been 3+ years and it is holding up very well. We did put down some beautiful ‘hand-me down’ cream colored area rugs over a portion of the floor as well, as concrete can be chilly to sit on. What has been a favorite project you have done in your home that was inspired by something you found on the internet? We’d love to hear about it! this is kind of amazing! I may have to stop over just to see this floor.